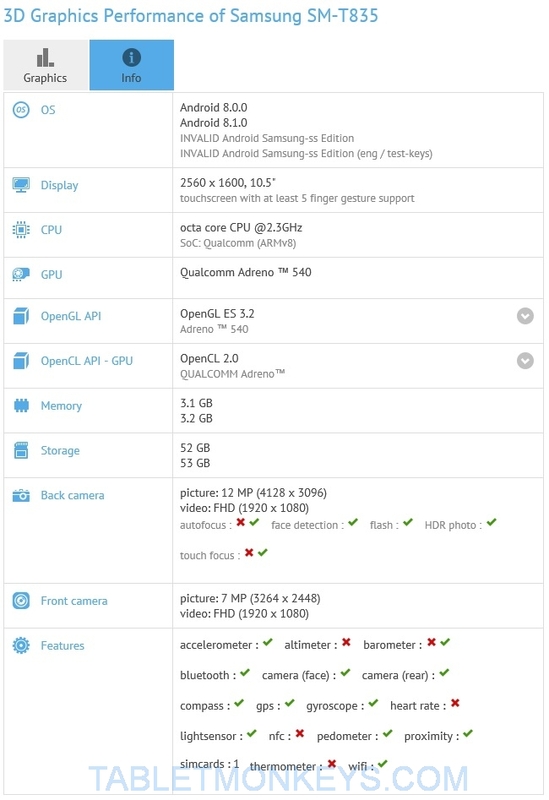 After two 3D graphics performance benchmark tests on May 17 for the coming new 10.5-inch Samsung Galaxy Tab S4 which are now viewable, we once again see that Samsung is testing the new tablet with Android 8.1 as well as Android 8.0, which increases the possibility that Samsung will launch the Samsung Tab S4 with Android 8.1 without the need to wait for an update. Some of the features that were listed as non-existent or unavailable in the first GFX benchmarks from the first leak during the start of the winter are now listed as available functions, such as the autofocus and touch focus on the rear camera. Storage and memory is also changed a tiny bit with Android 8.1. And it’s now listed with the GPU API as well. Tessellation Offscreen is down from 80.9 fps with Android 8.0 to 76.3 fps with Android 8.1, while the 1080p ALU 2 Offscreen results went from 90.4 to 82.8 respectively, so Samsung may still have some tweaking to do in their software labs before they are satisfied with the performance of the S4. Which could explain why the Wi-Fi certification for the Samsung Galaxy Tab S4 was pulled from the registrar right after publication.